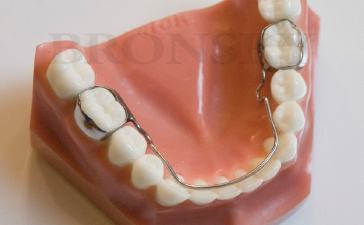 A Lingual Holding Appliance is comprised of stainless steel rings (bands) around posterior teeth (usually molars) and a stainless steel wire that passively contacts the inside (lingual) surfaces of the teeth. The Lingual Holding Appliance (LLHA) is used to preserve and create space in the mandibular (lower) arch and to aid in uprighting of the molars. 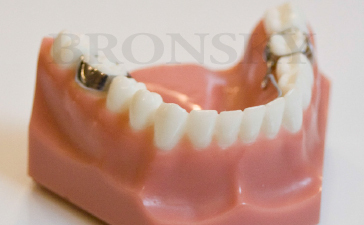 The appliance is placed on the lingual (tongue) side of the mandibular (lower) teeth. As the lower baby molars are generally larger than the permanent teeth that will succeed them, the LLHA helps to utilize this space to the patient’s best advantage. Please avoid sticky/chewy candies and gum. We suggest patients rinse with water after eating to help clean the appliance. Brush and floss as usual, taking special care to clean around the bands and the palatal arch. Upon initial placement, there may be some tongue obstruction, but your speech will be back to normal in just a few days. This appliance may be small but it is essential to the success of treatment!